Happy New Year – and my first 365 days on this site! Hadeland Kultursal byr på musikalsk fyrverkeri! 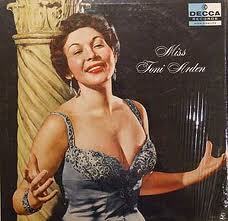 Incredibly enough – Toni Arden was one singer who had somehow slipped under my musical radar for a long time. It wasn’t until Jasmine Records put together a Box Set of her music that I discovered her. After all, Jasmine had collected 54 songs by this singer, which immediately alerted me to find out more; here was a singer who obviously had done quite a lot of recording! And as I found out later on, those 54 tracks were just the tip of the iceberg! Diving into her music, I discovered a very versatile singer, who started out in the late 1940’s – and who had kept on recording into the 1980’s. A wonderful singer with a very good voice, doing a wide range of different material – I very soon found I had a new musical favorite! Even though she mostly worked in the so-called rock ‘n’ roll area – Toni is very much a classic pop singer, but never afraid to take on a musical challenge outside of the great American songbook. Toni Arden was born February 15, 1924 as Antoinette Ardizzone and died at her home in lake Worth, Florida on May 29, 2012, at the age of 88. Arden started out as a big band singer in the 1940s, singing with Al Trace, Joe Reichman, Ray Bloch and Shep Fields. She started recording as a soloist in 1946 for the minor label National Records. 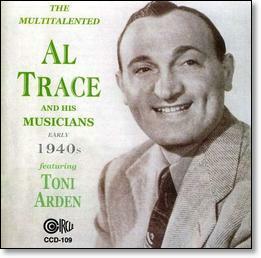 Toni was featured with Al Trace’s band in the mid 40’s, so here’s your chance to hear her beginnings! 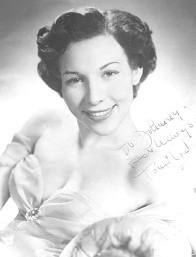 She then signed her first solo recording contract with a major record label, Columbia Records, in 1949. On this label she had several hits including “I Can Dream, Can’t I?” (which reached #7 on the Billboard charts), “Too Young” (which reached #15), “Kiss of Fire” (which reached #14) and “I’m Yours” (which reached #24). One of her earliest records was an English language version of Josephine Baker’s hit song of the 1930’s, “J’ai deux d’amours” – called “Two loves have I” in Toni’s version. She has an amazing ability to adapt her voice to the different material she sings, from smooth and silky on ballads, to an almost operatic vocal on her fabulous version of “Come back to Sorrento”. Her cover of Skeeter Davis’ 1953 no. 1 hit “I forgot more than you’ll ever know” gets the Toni make-over in such a way, you’d think the song was written for her! She glides through pop songs and foxtrots as if dancing on a cloud, yet she injects so much latin “fuego” into her Spanish records – she comes off as a very tough competitor to Lola Flores, Concha Piquer, Marife De Triana and Juanita Reina! She might not look like a typical Spanish senorita, but she sure does sound like one! 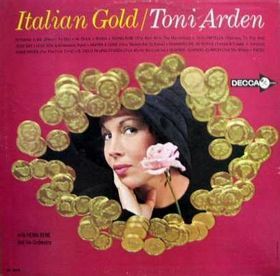 Toni Arden may also be the only caucasian singer who have really understood the difference between latin music and Italian music. The former is all about temperament and fire, the latter is all about emotions and keeping the embers just glowing. 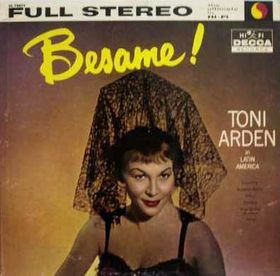 The proof of this is obvious when you compare Toni’s “Besame!” album with her albums of Italian songs! 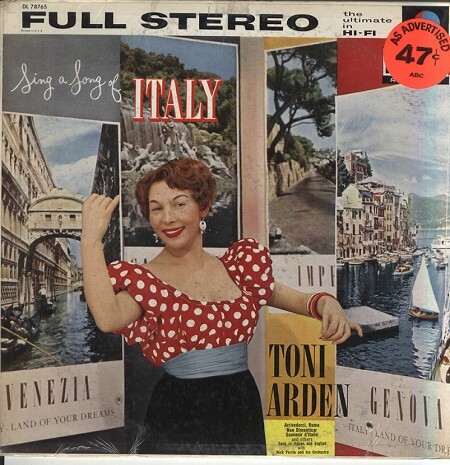 Another great album; On this Toni simply glows – the Italian way! In addition to making records, Toni was also a busy night-club act across the USA appearing in such venues as New York’s “La Vie En Rose” and “Copacabana”. She was also a regular guest on many popular television programmes like “The Ed Sullivan Show”, “The Dinah Shore Show”, and “The Bing Crosby Show”. She even appeared in a couple of movies – usually in singing guest spots. No matter what she did, she was the utmost professional – and earned rave compliments from both Frank Sinatra and Vic Damone for her singing and versatility. She slowly eased into more contemporary pop music and some early rock ‘n’ roll in the late 50’s/early 60’s, including a duet with her brother Jan Arden titled “Blow out the candle”. But like most other classic pop singer she was left in the shade during the 1960’s…. But as a night club attraction and supper club headliner she was still much in demand – and always displaying versatility, vivacity and that great voice! After her stint with Decca, she recorded for both RCA Victor and Mercury Records. Her last album “My World is You” came out 1981 and features songs solely written by Gladys Shelley. Her last album! Recorded 1981, Toni does the songs of Gladys Shelley…. 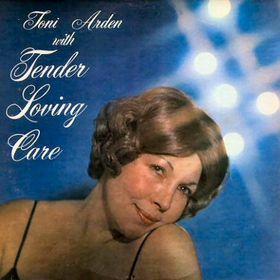 Thanks to re-issue labels like Jasmine and Sepia Records, most of Toni Arden’s music is once again available – and she definitely should be re-discovered by music lovers everywhere! She is a truly wonderful singer, whose passing away last year barely got a mention in the papers…. That’s a pity – because her talent succeeds her reputation by far! I have been around a while, 82 years, but I still think back to the many times I played Toni Arden on my home made “Hi Fi”. The sound of this hi fi was really good but Ttoni Arden’s singing was great. Hi Nicholas! Thanks for writing! Sometimes I wish I was born a lot earlier (I’m 47); listening to original Toni Arden vinyl records on a home made HiFi back in the 50s & 60s sounds like a dream scenario to me! 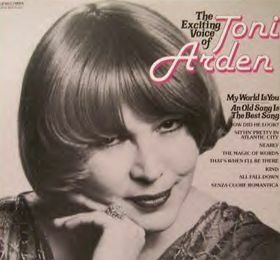 I hope you still continue to enjoy Toni Arden’s Music, in whatever format it is available in these days! GREAT(OTHER)SINGER DON CORNELL HAVE HAD THE BEST SELLER RENDITION….KUDOS TO TONI..
listen to her “I’m A Fool To Want You” it is not only beautiful I cry listening to To i singing it.